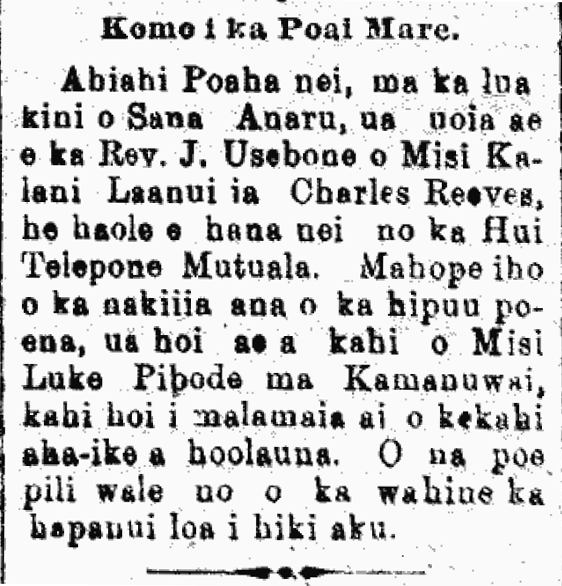 Kalani Laanui marries Charles Reeves, 1897. Joined in the Company of Wedded People. In the evening of this past Thursday, at Saint Andrews Church [luakini o Sana Anaru], joined by the Rev. J. Usebone was Miss Kalani Laanui and Charles Reeves, who is a haole that works at the Mutual Telephone Company [Hui Telepone Mutuala]. After the bond was tied, they went to place of Miss Luke Peabody [Lucy Pibode] at Kamanuwai, where a reception was held. A great majority of the people who came were those who know the bride. Ka Makaainana, Buke VII—-Ano Hou, Helu 21, Aoao 1. Mei 24, 1897.